I flew with ANA from Sydney to Haneda. 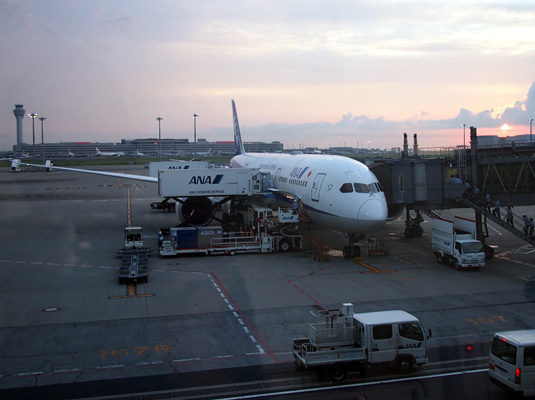 This was my first flight with ANA and first time to Haneda. I was aware they are rated as a 5-star airline so I was looking forward to be flying with them. I was happy to see the flight was on a 787. I enjoyed in inflight meal and entertainment options, and I loved the Japanee service on the flight. The most noticeable quality for me was the legroom in economy which makes a difference on a long flight. Flying into Haneda was also easy, with the monorail into Tokyo. 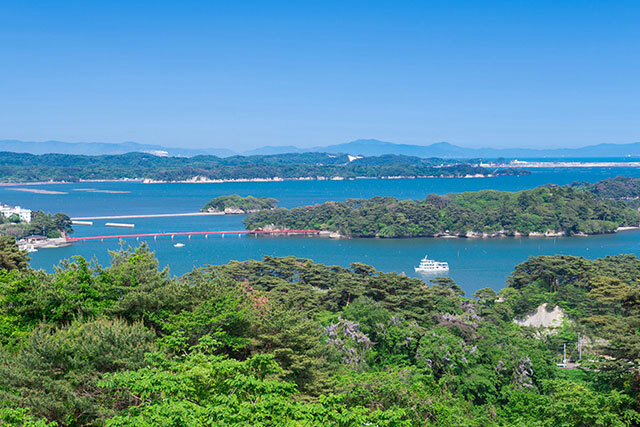 When you think of Tokyo, a concrete jungle usually comes to mind. 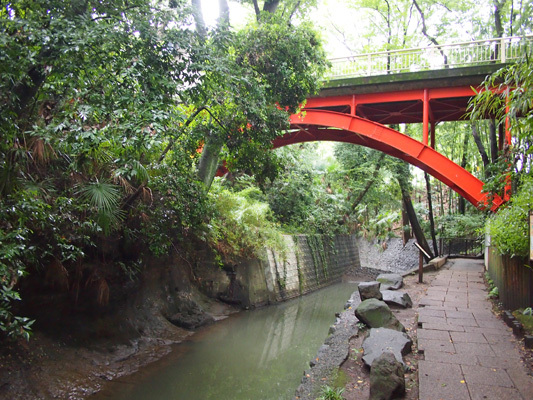 I was surprised to find that there is like an actual jungle along a river walk at Todoroki Valley. This valley feels like you are in the countryside and the waterway is surprisingly clean. 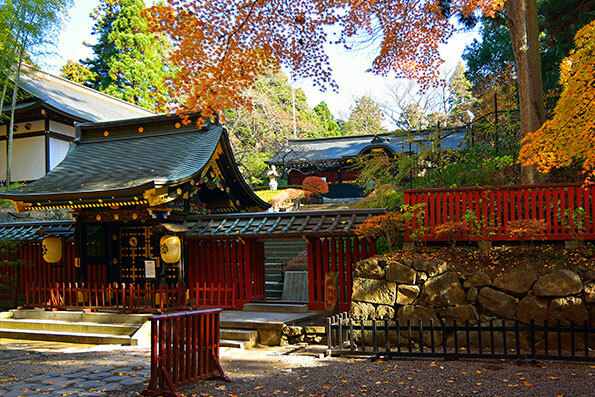 There is also a beautiful little temple at the end of the walk. I would never have though to come here if I wasn’t on the tour, so I was glad to have been shown another side of Tokyo. 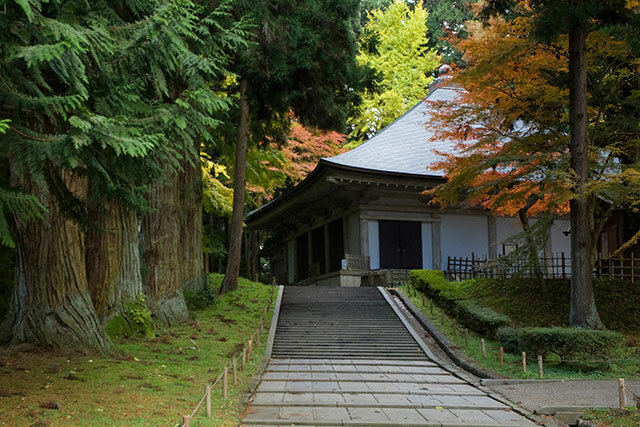 Just a short train ride from the centre of Tokyo, Todoroki Valley is a beautiful place to escape the concrete jungle. 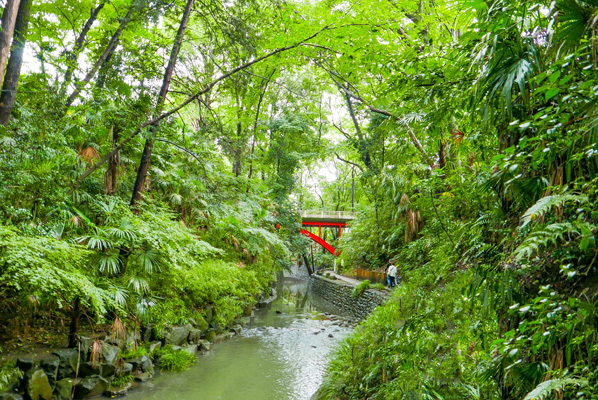 As the only valley in Tokyo, this natural oasis has a beautiful river running through it, with towering trees, walkways, bridges, shrines and waterfalls creating an idyllic atmosphere. 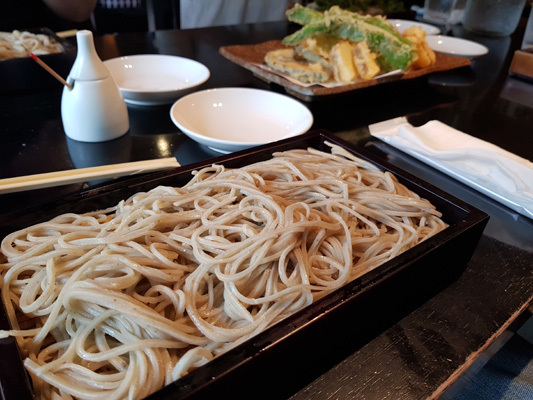 We had lunch at Matsubara-an Keyaki and I got the cold soba noodles with sesame sauce. I enjoyed the entree of rare sliced duck, and the noodles were delicious. 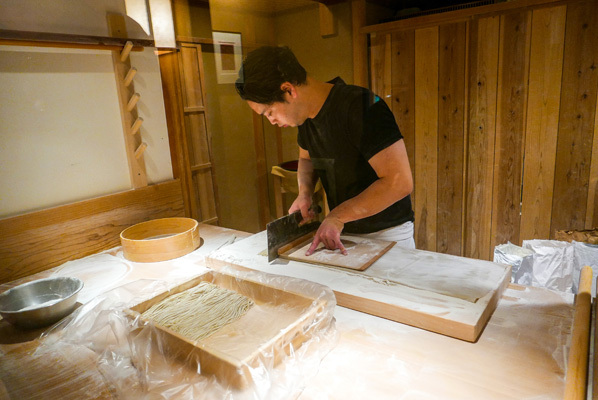 I liked the homely atmosphere of the restaurant, and being able to watch the noodle maker at work was interesting. Matsubara-an Keyaki was a great restaurant where we could try Japanese food like tempura, sashimi and soba in a traditional setting. The food was high quality and delicious, and we even got to see the chef making the soba noodles that we ate, which added a nice touch to the meal. 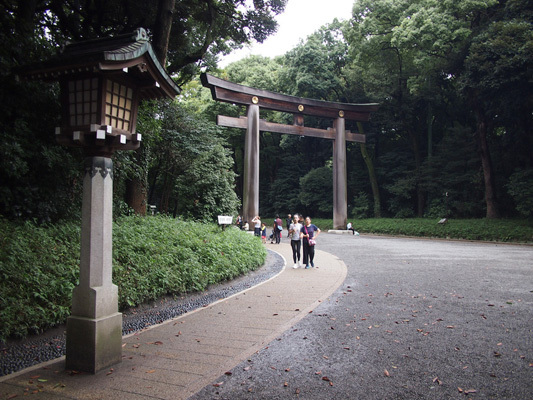 I love city parks so Meiji Jingu was a great place to visit. It’s amazing that this tranquil place is right in the middle of the city. I’ve been to many city parks around the world, but I don’t recall a park that has such a grand forest. To think that Shibuya and its famous crossing among the skyscrapers is nearby, yet another world away. It was interesting to see the ornamental sake drums, and learn about the rituals of entering the shrine. 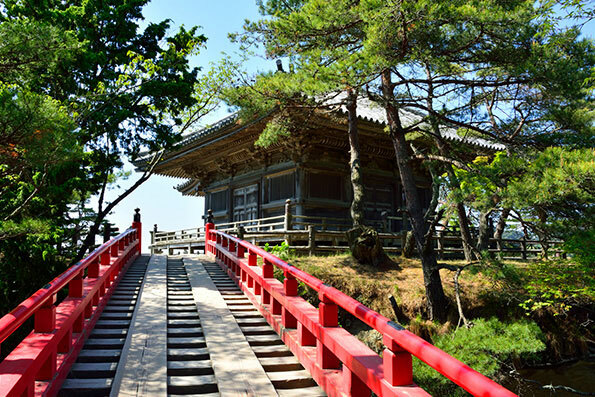 Even though the shrine is a reconstruction it still has an old world feel. 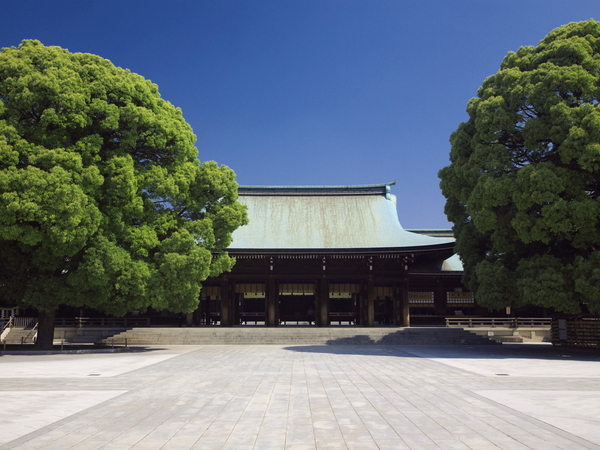 Meiji Jingu deserves to be at the top of everyone’s list of must-see places in Tokyo. 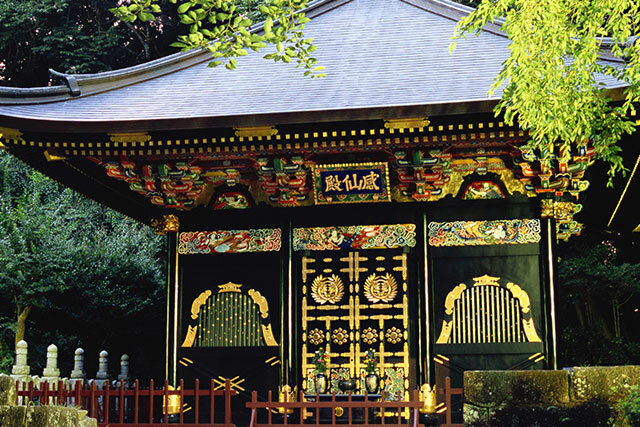 Not only is it a peaceful oasis filled with nature in the heart of the city, it’s a special site of cultural, historical and religious importance where you can learn a lot about traditional Japanese customs and beliefs. Next door to the Meiji Shrine we visited Yoyogi Park where is quite famous for people watching, especially on the weekend when people get dressed up and congregate around the Harajuku area. The park has a good mix of open spaces, water features, and some densely forested patches. It was a bit rainy when we went so not so much people watching. 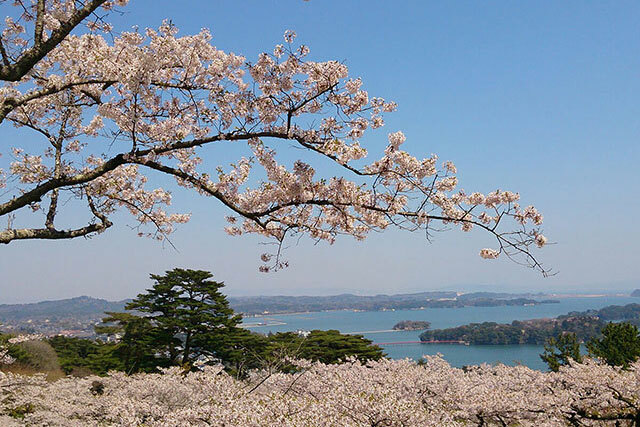 It’s a beautiful park whatever the weather, and I will come back here one day to see the cherry blossom (sakura) season. 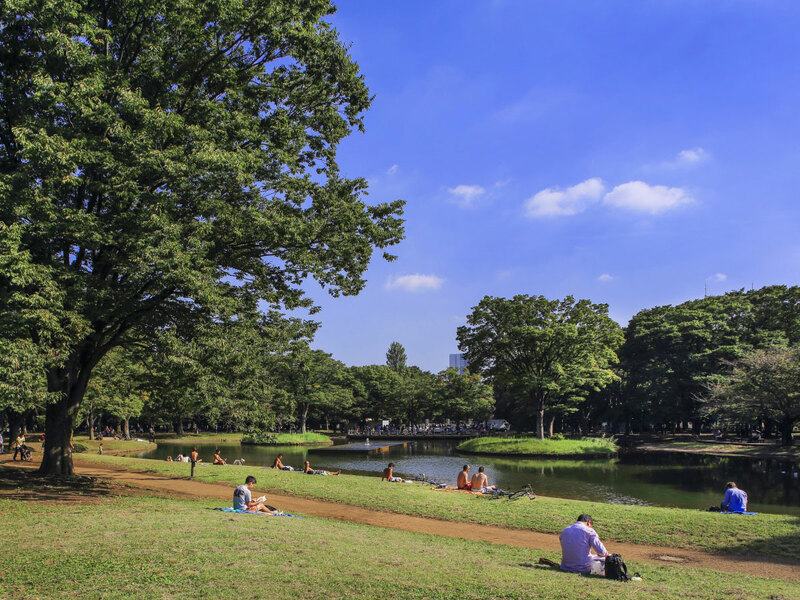 Yoyogi Park often earns a place in foreign tourist guides for the cool crowd of rockabilly dance groups who converge on the site every Sunday, but there’s so much more to this urban oasis than meets the eye. Once a military parade ground, the park was used as the Washington Heights U.S. military barracks after the war. 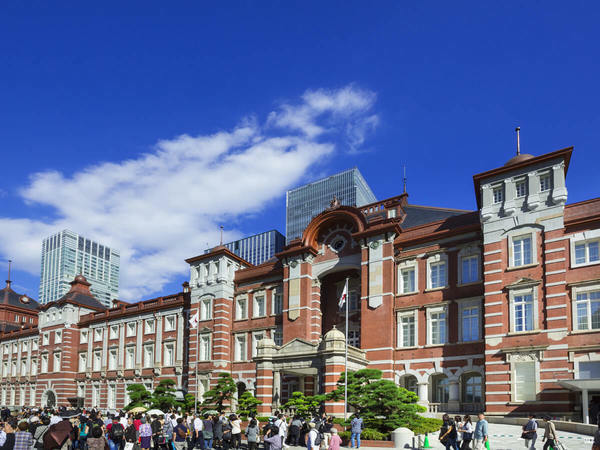 During the 1964 Tokyo Olympic Games, international athletes were housed here. A stroll around the park will take you to a number of important monuments, along with fountains, a cycling course, a rose garden, and dense forests of trees. 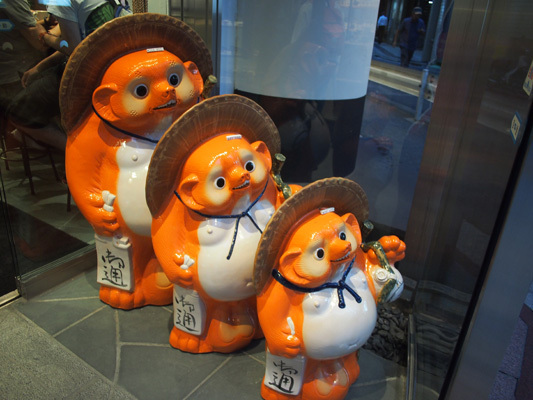 Among the many things that Japan is associated with is the designer shopping experience. 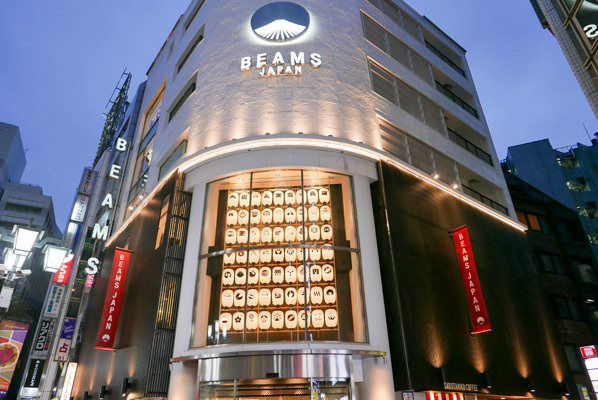 Visiting Beams Japan in Shinjuku was a good introduction to Japanese retail experience and design aesthetic. I liked how they represent each prefecture of Japan throughout the store. If you are looking for unique gift ideas then you will find many things here that are beyond the ordinary. 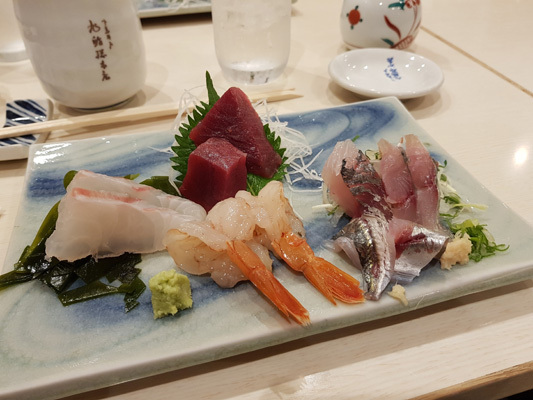 I couldn’t visit Tokyo without having a sushi experience, and what an experience is was at Asahizushi Sohonten. We had a 6-course meal which was a wonderful introduction to sushi cuisine. In addition to the usual pieces of sushi I’m familiar with we tried some dishes that I had never tried before. Beams Japan is a surprising treasure trove where you can find all sorts of classy Japanese goods from a large number of different prefectures. It’s a great place to learn more about about famous regional products while discovering innovative items like Birkenstock geta sandals, which combine tradition with modern styling. 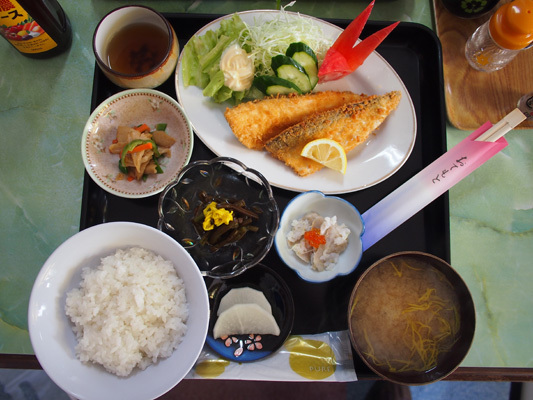 Asahizushi Sohonten serves up a delicious meal course, with fresh sashimi and sushi in a bright and cosy setting. 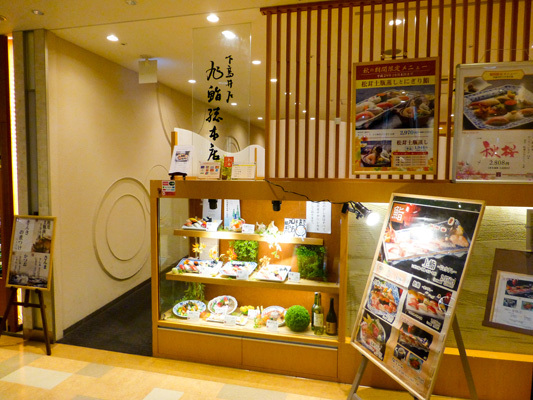 A great place to stop for a meal while out and about in the busy Shinjuku area! 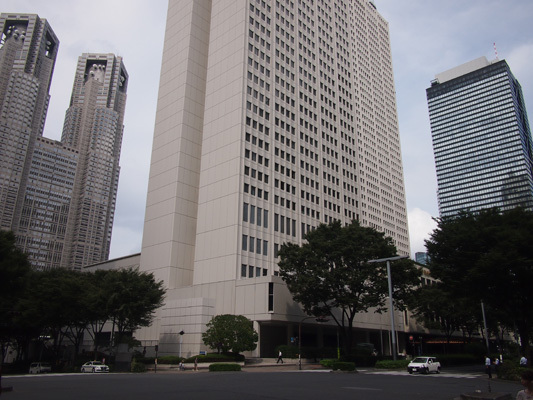 The Keio Plaza Hotel was an ideal base for exploring Tokyo. 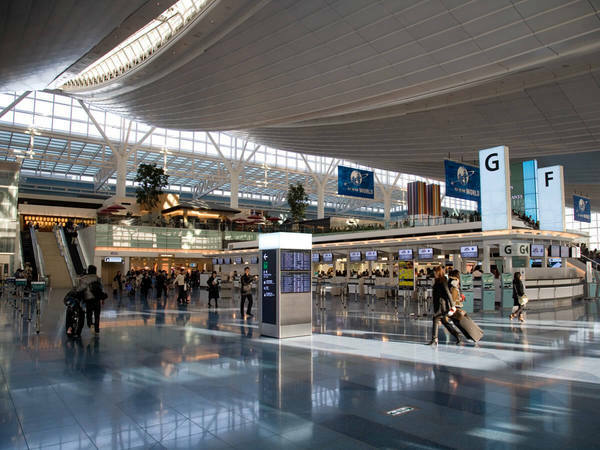 Situated near Shinjuku station it was easy to get to from Haneda airport and there are lots of good shops and food options nearby. The hotel itself is massive, taking up a whole city block. My room was comfortable and the check in staff were polite and professional. Keio Plaza is conveniently located close to Shinjuku Station, and they offer an excellent service that allows guests to use a smartphone for free during their stay. 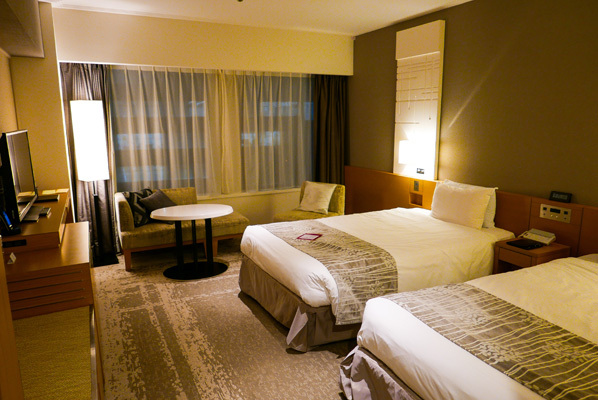 The hotel room was large by Tokyo standards, with a nice refurbished fit-out and comfortable twin beds. 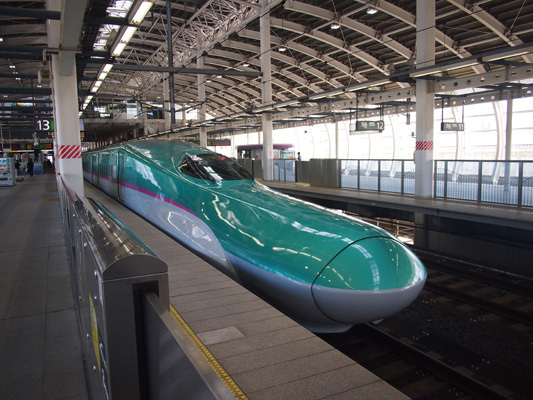 The Shinkansen is the most famous high-speed train in the world. 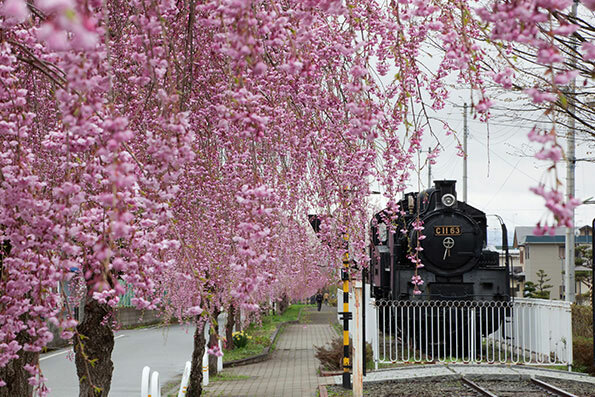 Taking this train is a must-do activity on a visit to Japan. Sure enough, everything I had heard about the Shinkansen was true. The modern train stations are easy to navigate, the trains leave on time (to the second), and the carriages are clean and spacious. And the ride is so smooth that you barely realise you are going so fast. And yes, even the toilets on the train are those wonderful Japanese-style wonder-toilets. 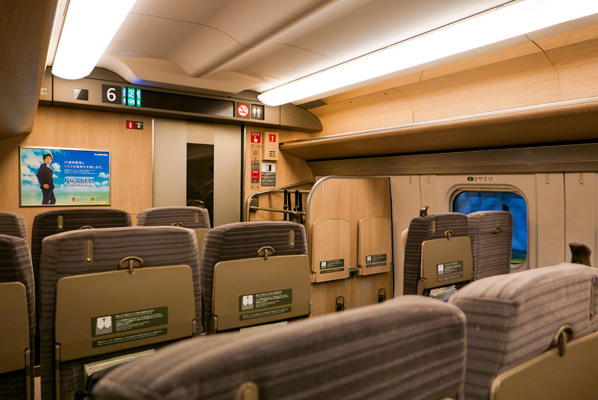 The shinkansen ride was very comfortable and all seats had plenty of leg room. It was a very relaxing way to make the long journey from Tokyo to Aomori. 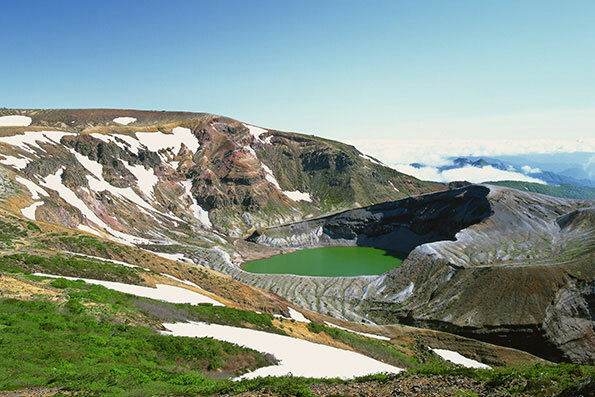 Approximately 2 hours from Shin-Aomori Station by car. 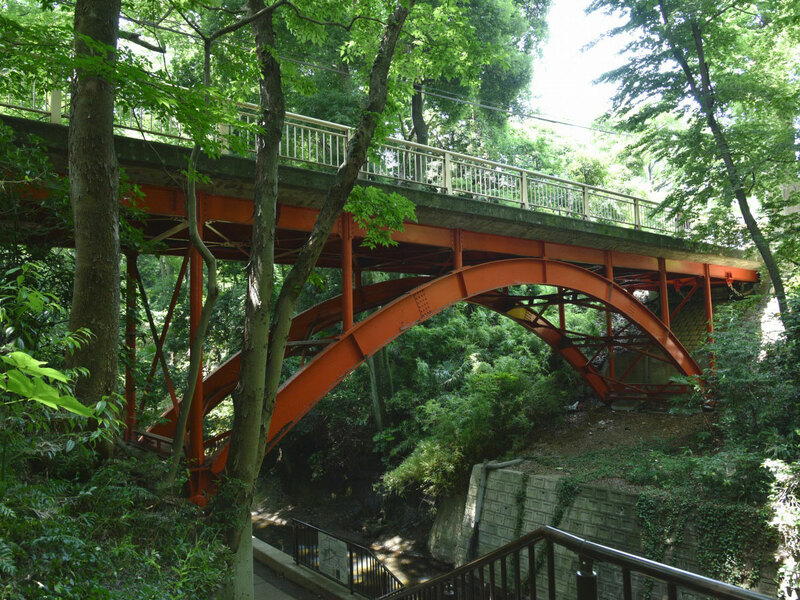 Rent bicycles from the Oirase Stream Museum, which is situated close to Keiryu-no-Eki Oirase (a gift shop and restaurant), and is a hub for sightseeing in the Yakeyama District. Inside the museum, you can enjoy the kokedama (moss ball)-making experience and gourd-lamp-making experience, and in the winter, try the candle-making experience. We got a first glimpse of the stream on the bus on the way to the lake. I kept wanting the bus to stop, so I was glad that we instead got to return by bike. 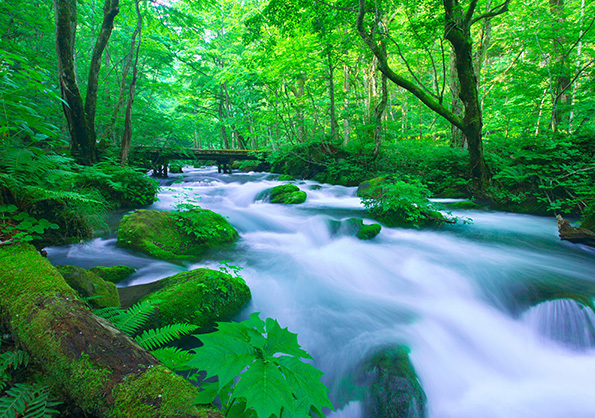 The stream is like out of a fairy tale, with fast-flowing pristine water, and waterfalls along the way. The road is easy enough to travel on with not too many big hills, and it follow the path of the river so it is scenic all the way. The walking path looked incredible. 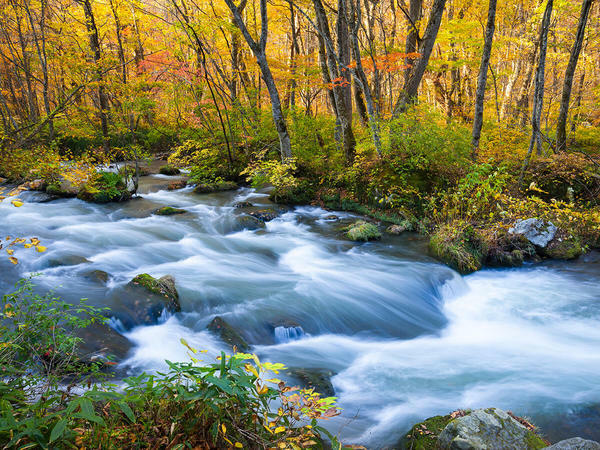 With an overall length of about 14 kilometres (8.7 miles), Oirase Stream is a wonderful place to take a stroll in the crisp, fresh mountain air. 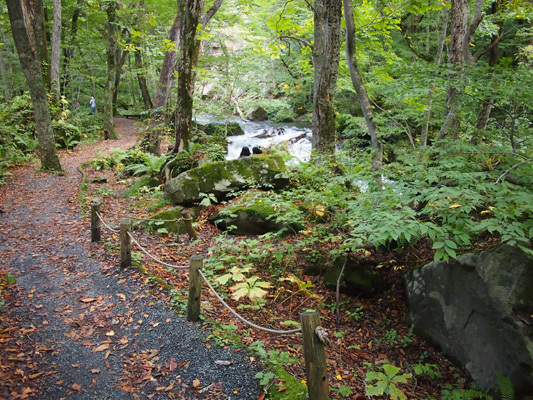 While the walking path beside the stream is popular with tourists, a more enjoyable option is to take in the scenery while on an electric bicycle. Cycling is easy with the electric assist, and it allows you to cover the whole area in a much shorter time period, leaving you with more opportunities to stop and admire all the beautiful cascading waterfalls along the way. At Lake Towada we had lunch at Towadaya Shokudo where has a very homely feel like it is in someones house. The matriarch of the house came out and took out orders with a baby wrapped around her back in the traditional Japanese way. As this was the first thing we did after arriving from Tokyo it felt like different pace of life to that of capital. Our lunch was fresh fish caught from the lake just outside, and I had the fried version which was tasty. 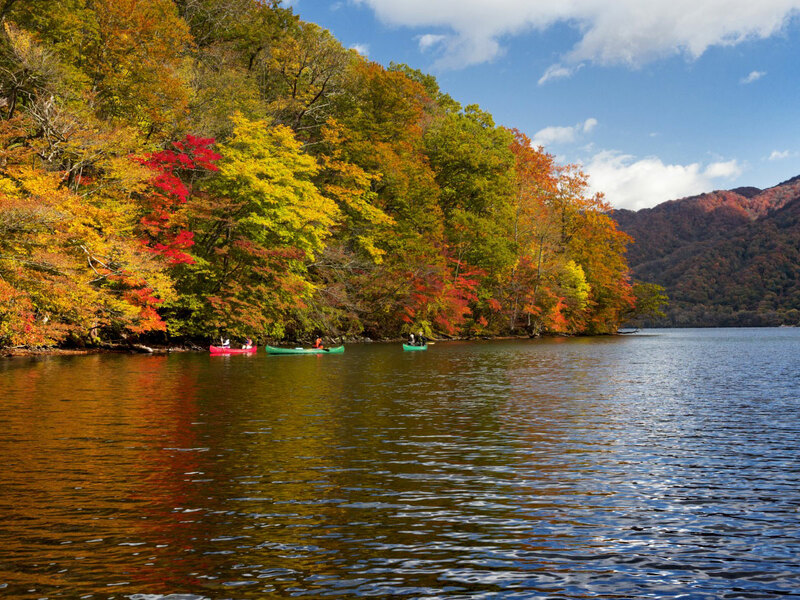 Lake Towada was a real surprise for me. 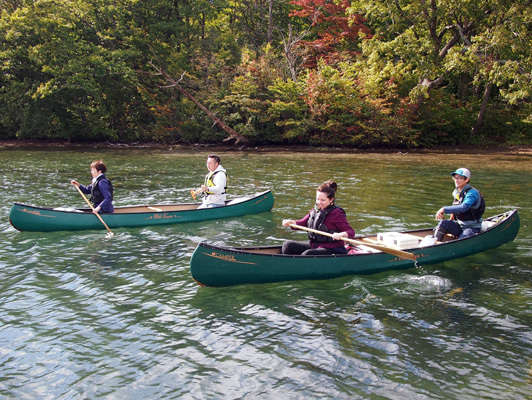 The canoe guide was very knowledgable about the lake and canoeing, and his passion for nature and the lake stood out. The thing I noticed was how clean every thing is here. 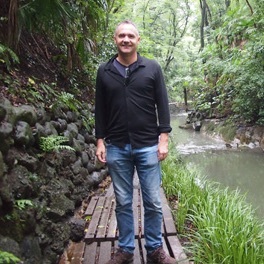 Having travelled extensively through Asia where the environment is not much considered, it was heartening to be in a place with no trash and such clean water. 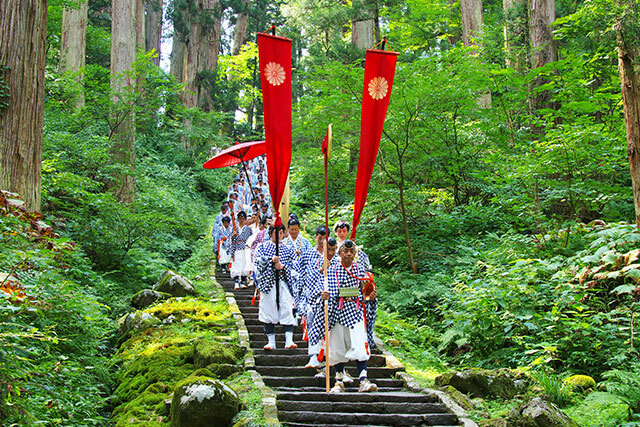 One of the best things about travelling to rural areas in Japan is the chance to live like the locals and experience their generous hospitality. 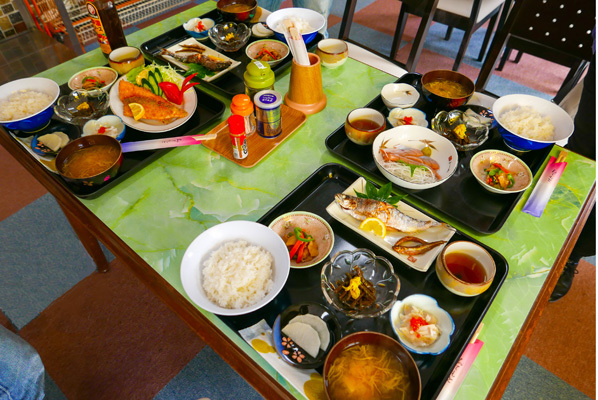 The family who runs Towadaya Shokudo makes you feel instantly at home with a relaxed atmosphere and delicious home-cooked meals using fresh local produce. It’s like enjoying a meal at a home away from home! 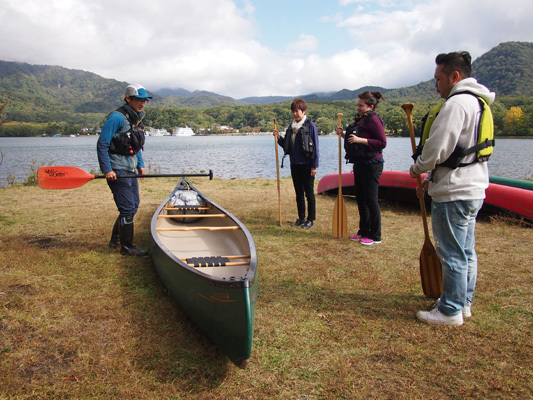 Whether you’re a seasoned rower or an absolute beginner, a canoeing experience on Lake Towada with the friendly guides from Nature Experience Greenhouse is something you should definitely do while in the area. 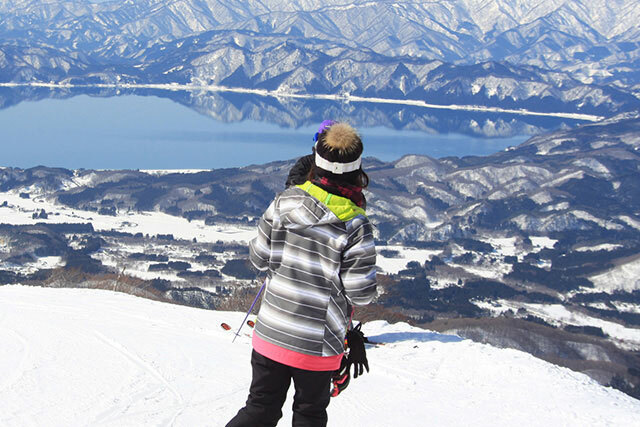 As the largest crater lake in Japan’s main island of Honshu, Lake Towada’s beautiful blue colour comes from the fact that it’s an impressive about 327 metres (1,073 feet) deep. Located in the caldera of a volcano, the water is clean and clear, allowing you to see a number of fish, especially trout, while out in the canoe and surrounded by the forest of the national park. 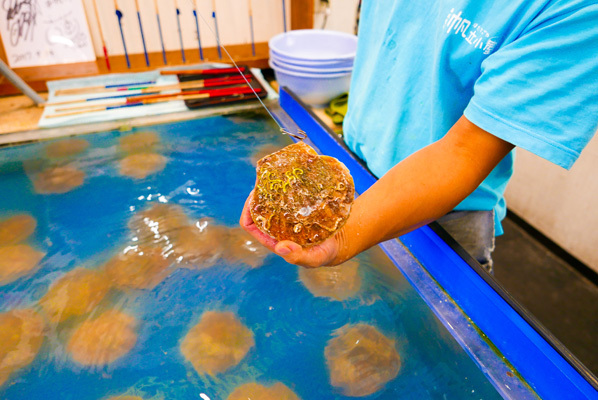 The knowledgeable guides know everything there is to know about the local flora and fauna, pointing out things you wouldn’t notice at first glance, making for an incredibly enjoyable and memorable experience. Dinner at the Hoshino Resorts Oirase Keiryu Hotel was a buffet style. One detail I especially liked was the tray plate which into 9 little plates. Rather than piling on a big pile of food this made you think about getting smaller samples of more things. 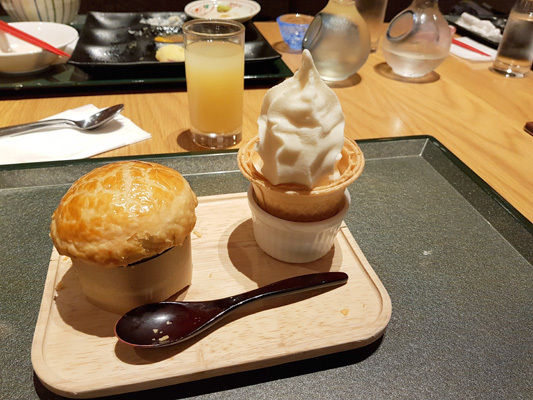 Aomori Prefecture is famous for apples so of course I had to try the various apple desserts. 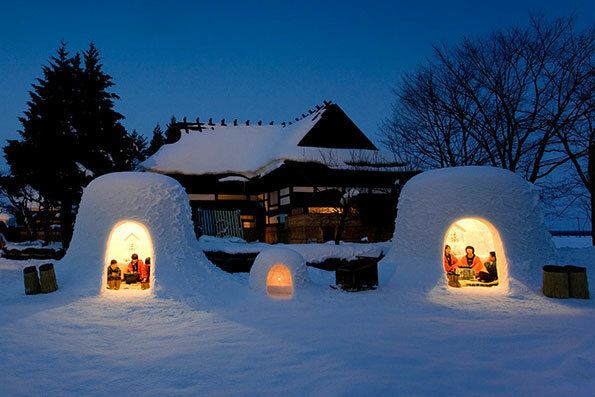 The Hoshino Resorts Oirase Keiryu Hotel is a hotel you can tell has been designed to blend in with its environment. The hotel faces the Oirase Stream and is built wide rather than high. Having the river as a view from my room was a bonus. My room was spacious and the bed was very comfortable. The buffet dinner at the Hoshino Resorts Oirase Keiryu Hotel is absolutely amazing. 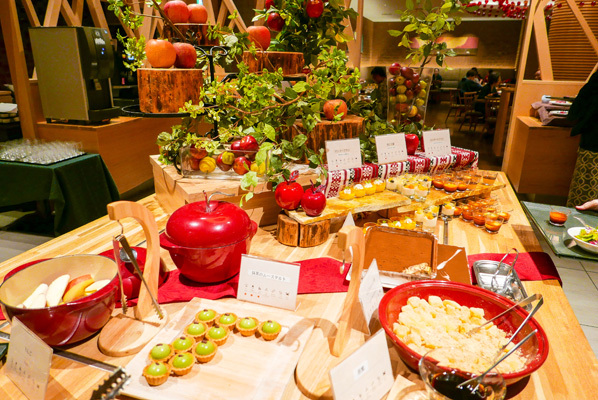 Aomori’s prized apples are the star of the show here, with most of the food options featuring the fruit as a key ingredient, and lots of adorable apple decorations presented beautifully on the tables. The highlight of the meal was the fresh juice made from locally sourced apples and the apple pie and ice cream dessert set, served on a delightful wooden board. Everything was fresh and delicious! 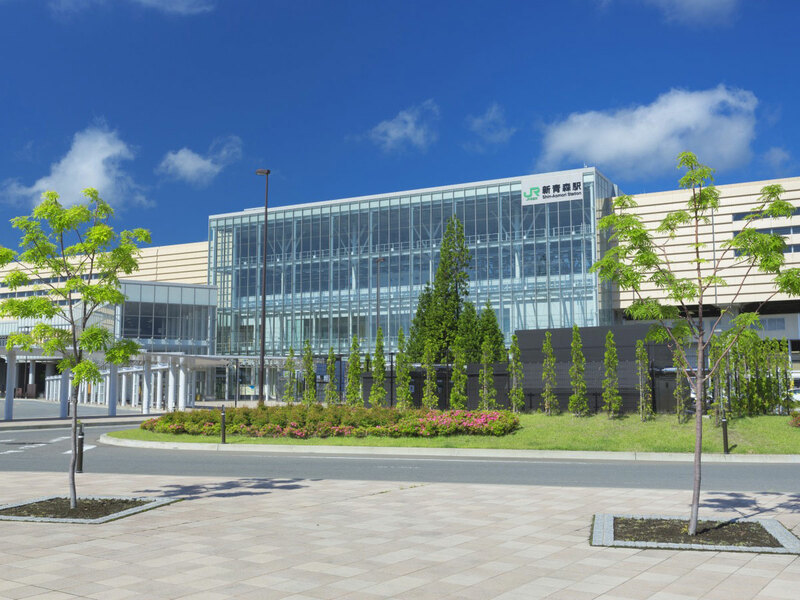 The Hoshino Resorts Oirase Keiryu Hotel is a stunning hotel complex, with beautiful public baths and common areas making it a delight to explore. 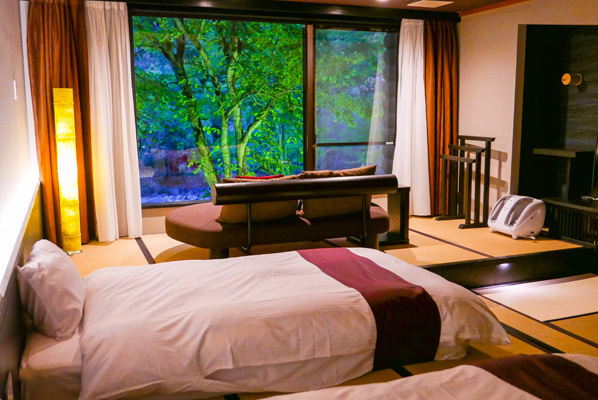 The Japanese-style twin room was large and spacious, with a gorgeous view over Oirase stream. Mood lighting created a wonderful ambience in the room, and the beds were incredibly comfortable. The breakfast was delicious and the service was to a very high standard. 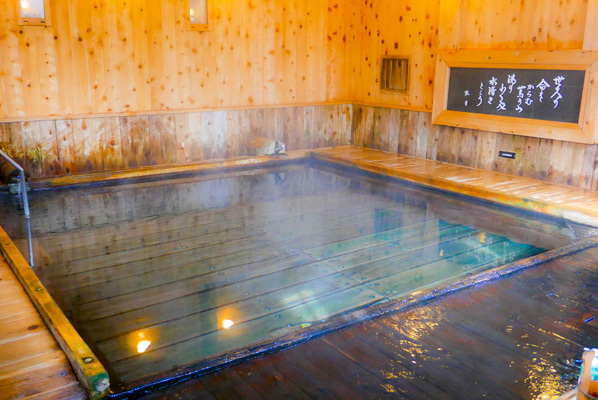 The Tsuta Onsen is in a traditional old wooden building with the hot water coming from the hot springs below. 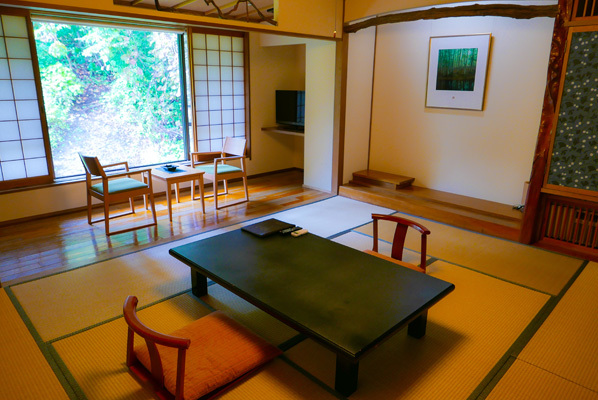 The rooms are modern with the latest amenities but they keep within the traditional Japanese style (apart from one western-style room). 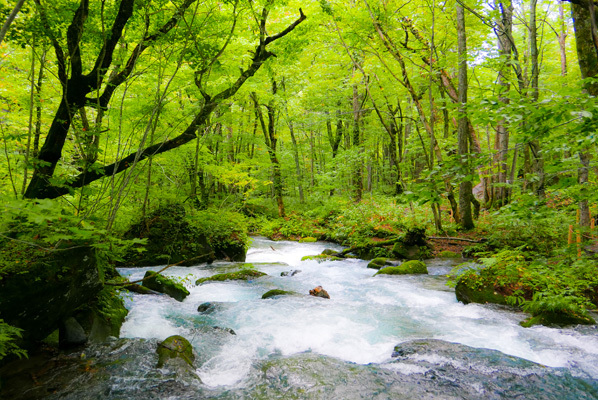 The onsen is set in a natural environment with a number of walking paths in the surrounding forest. 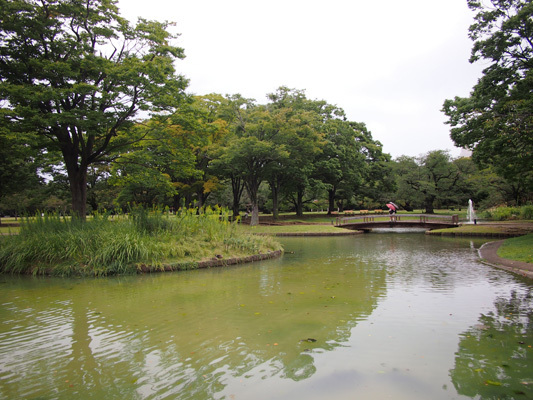 There is a beautiful little lake nearby and the paths are well-maintained. I have never been to an Onsen before, but I suspect this is a far better experience than visiting a city Onsen. 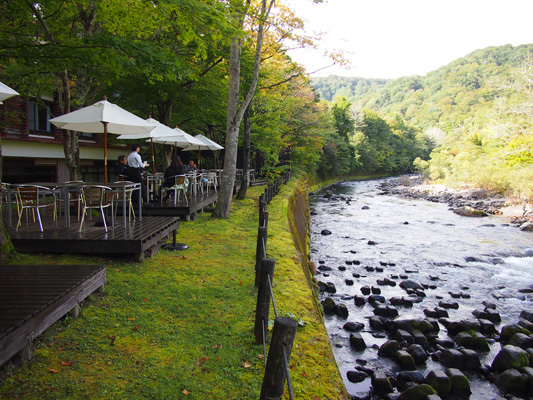 Tsuta Onsen truly is one of Aomori’s hidden gems. 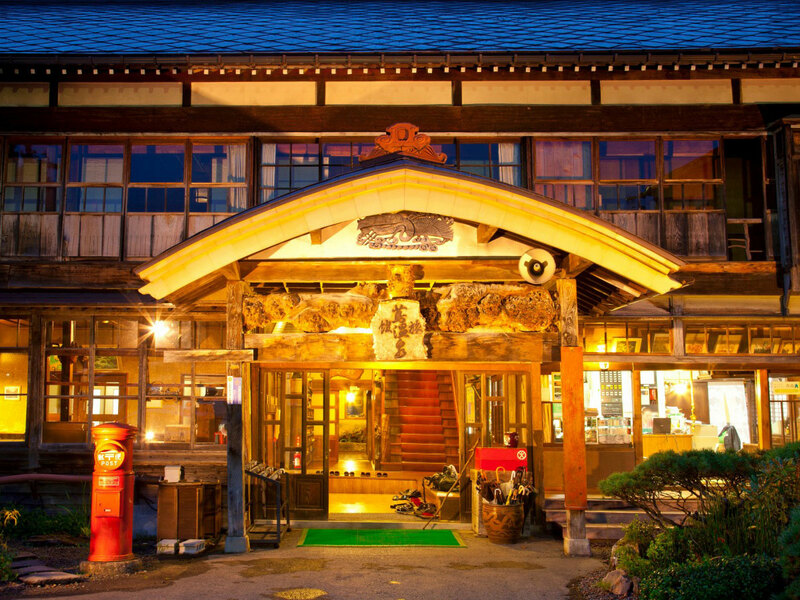 Nestled in a mountainside and surrounded by a forest of virgin beech trees, the rustic inn here has over about 100 years of history behind it, while the hot spring itself dates back about 1,000 years. Tsuta Onsen is one of the rare spots in Japan where you can bathe directly on top of the water source and enjoy the hot water gently bubbling out from the wooden slats on the ground underneath you. 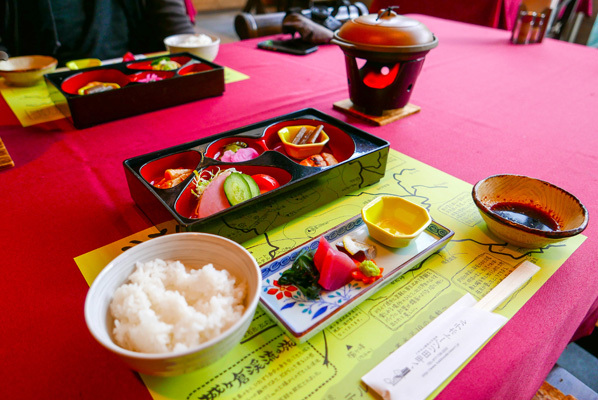 Whether you choose to stay in one of the beautifully appointed rooms or stop by for a dip in the hot springs and a walk around the nearby trails, a visit to Tsuta Onsen is a wonderful experience. We had a set lunch at Hakkouda Resort Hotel. 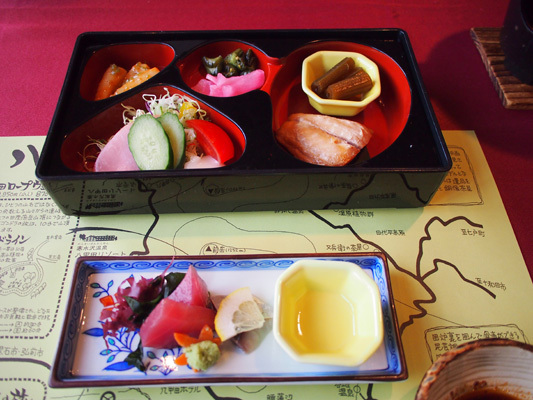 I enjoy the Bento Box lunch set where a selection of food style is picked out for you. I tend to stick with what I know when confronted with an unfamiliar menu, so this style of eating is ideal. We had sashimi with assorted picked vegetables and it was all good. 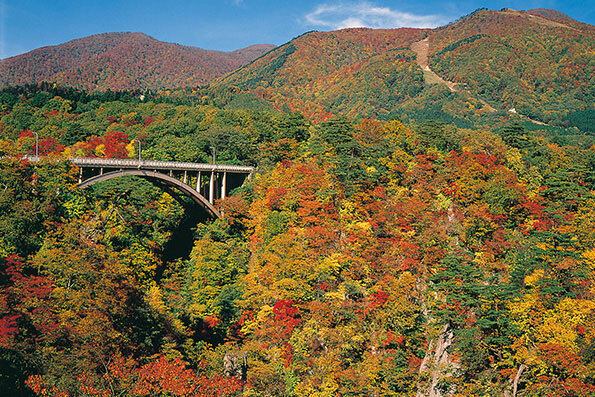 The Hakkoda ropeway is a stunning way to reach Mt. Hakkoda. 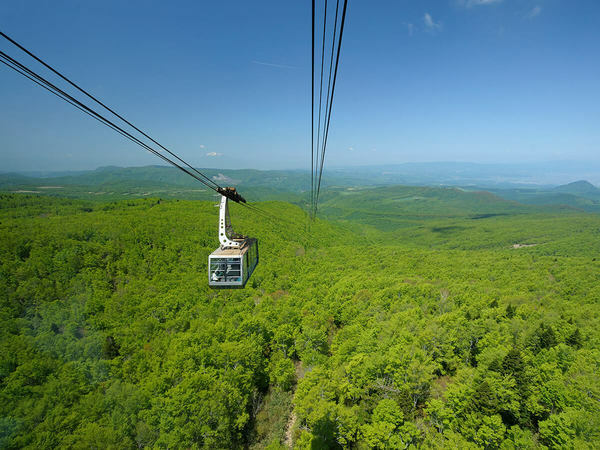 The cars of the ropeway glide over a forest. We were there at the end of September so the trees were just starting to turn yellow. You could notice the colour changes the higher up we went. 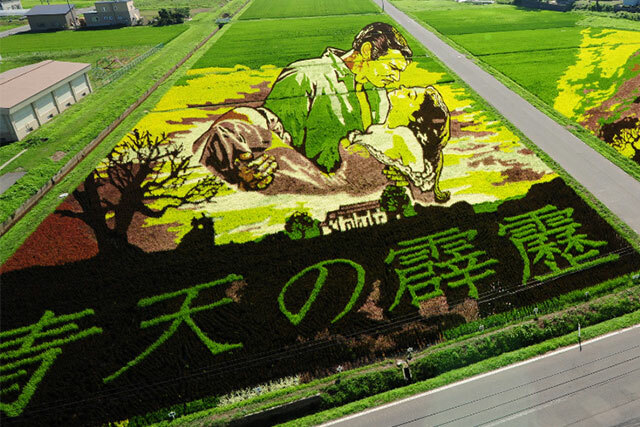 It must be an incredible sight in the midst of Autumn. 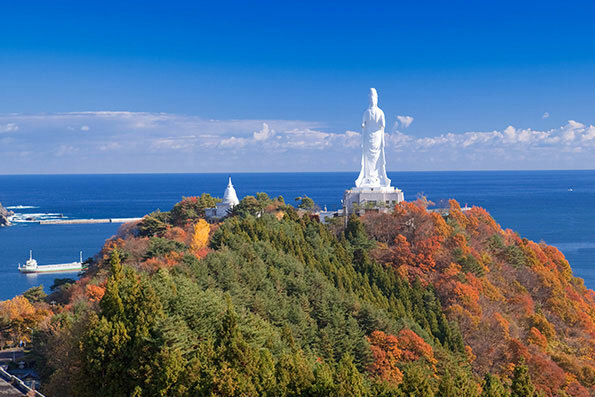 The view going up and down gave a fair indication of the surrounding view, including being able to see Aomori city and the coast. Hakkouda Resort Hotel has large restaurant served up a delicious set lunch that included fresh sashimi and freshly cooked pork. 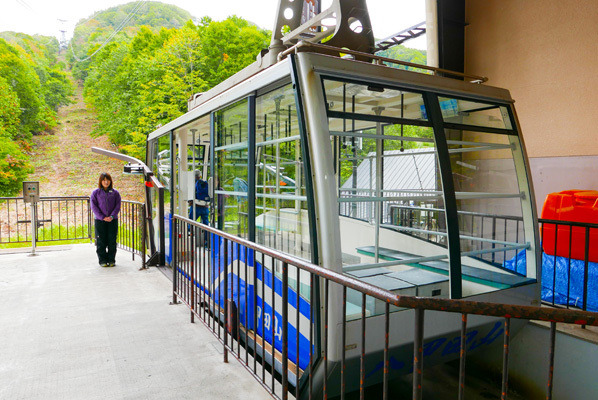 The Hakkoda ropeway is a fun and easy way to ascend to the top of Mt Hakkoda while enjoying the gorgeous mountain scenery. 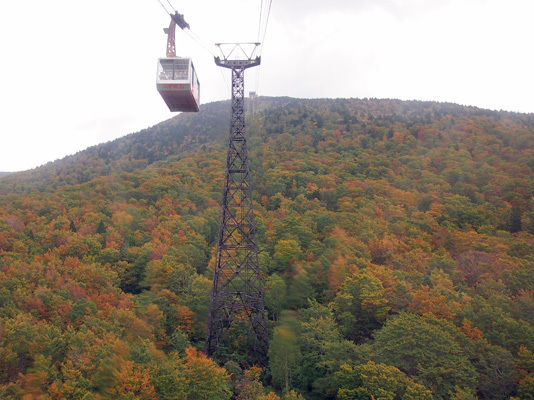 During the fall foliage viewing season, the mountain comes to life with a beautiful patchwork of coloured leaves, making the trip to the top even more enjoyable. Even on a rainy day, it’s possible to look out from the top to enjoy expansive views of the region. We stopped off at Hotate Goya restaurant which is famous for scallops. Being at a seaside city it seemed appropriate to stop for some kind of seafood. At the restaurant the scallops are live in a tank, and as a bonus you get to try and fish them out of the water using a fishing rod with a hook. It’s a bit of fun and you know that your scallops are as fresh as they come. The restaurant had a great ambiance, with hanging lanterns that are used in the Aomori Nebuta festival, which the city is most famous for. 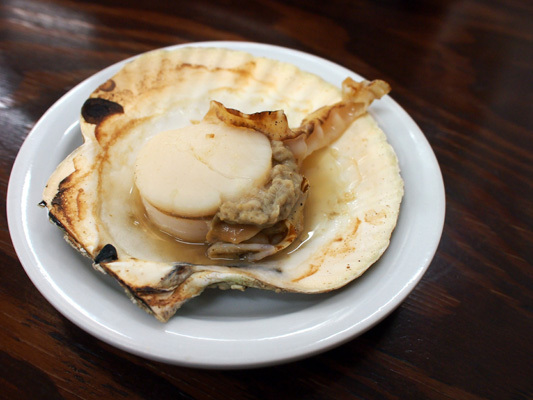 Hotate Goya is a unique restaurant where you can fish for your own scallops and then choose how to have them cooked. The service here was fun and friendly, and the no-frills, local tavern-like interior gave this place a nice relaxed atmosphere. Overall this was a balanced introduction to Japan in a short space of time. 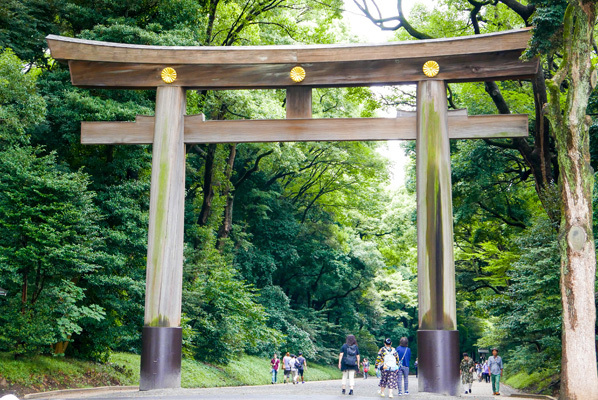 Starting in Tokyo seems like a natural choice for any visit to Japan. A life time of visits to this amazing city will never be enough. I would be happy to pass through here every time I come back to visit another place in Japan (and I will be back!) I also enjoyed visiting a place I wouldn’t have thought to visit. 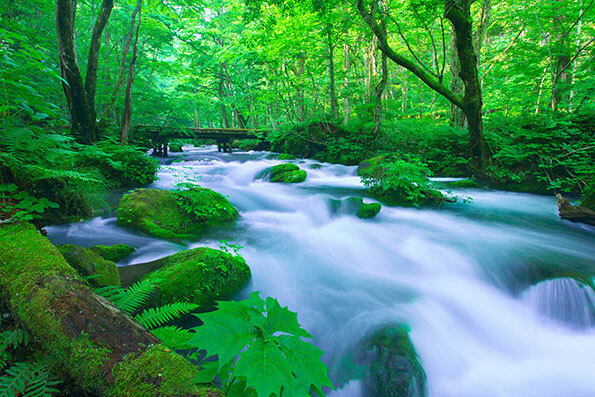 I enjoyed the nature of Aomori Prefecture. It was great to enjoy such an interesting place without the crowds of the more famous places. 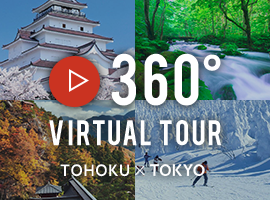 This trip takes you to some of the best sites around Tokyo and Aomori, and is a great way to experience two different sides of Japan in just a few short days. 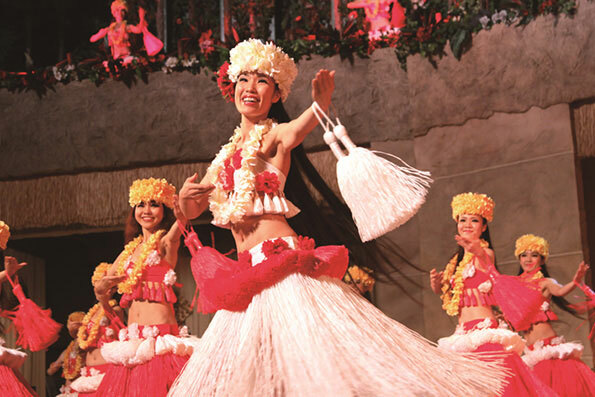 It’s a great tour to add to your itinerary! 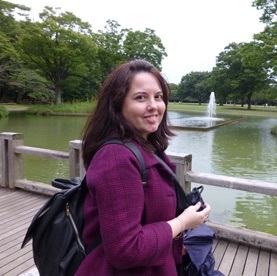 The tour was a good combination of being an introduction to Tokyo and visiting a lesser known part of Japan. 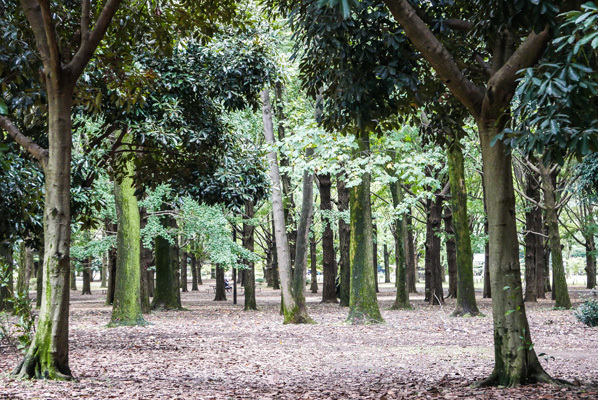 I enjoyed the nature theme tour of Tokyo as it visited the central spots ｓurrounded by nature as well as somewhere I would not have thought to visit. 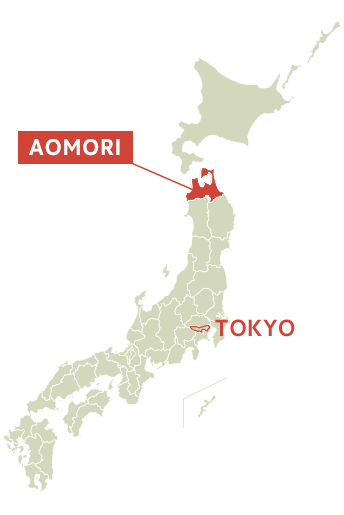 I would never have considered visiting Aomori Prefecture by myself, but I am glad I got to see such a beautiful place that hasn’t been overwhelmed by tourism crowds compared to some of the more famous sights in Japan. 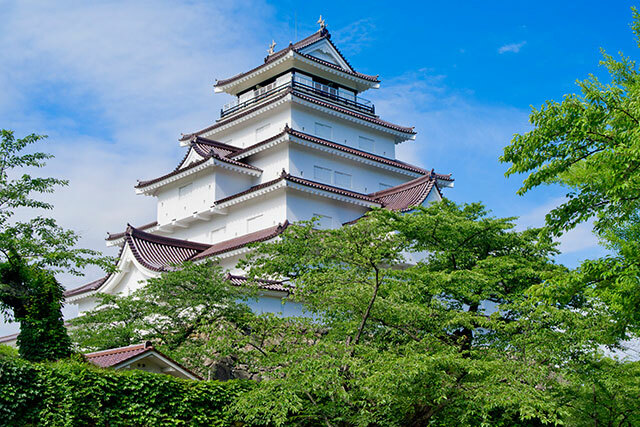 This is a great tour for nature lovers, as it lets you explore the natural scenery in both the big metropolis of Tokyo and also in the beautiful northern prefecture of Aomori.